This option provides a 4 inch (101.6 mm) centerset, chrome-plated brass gooseneck spout with wrist blade handles and is furnished with mounting collars and nuts. The faucet includes an aerator restricting the flow to a maximum 1.5 gallon (5.7 lters) per minute. 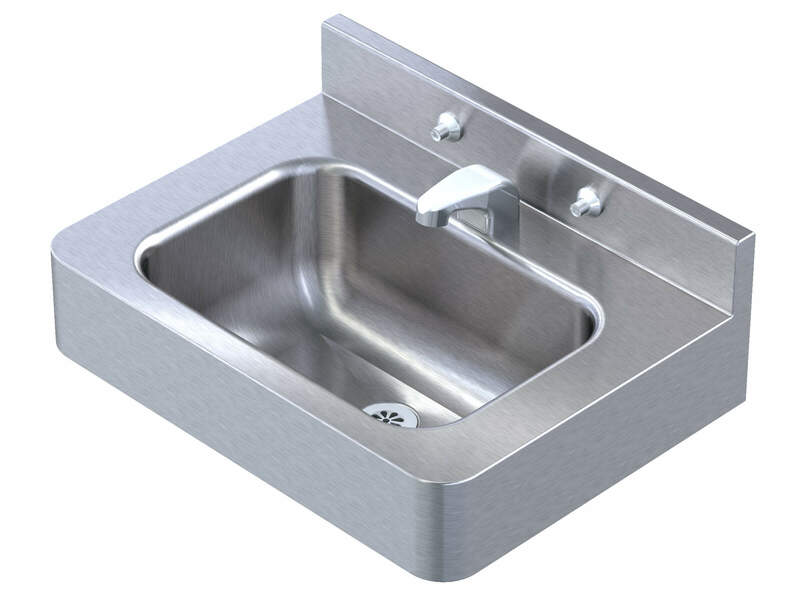 This option provides a chrome-plated center set spout furnished with mounting collars and nuts. This option is available on Acorn security lavatories or combys. The options provides for a deck mounted spout. It is used in conjunction with an Air-Control™ valve or other electronic valve. The flow is rated at 0.50 gallons (1.89 liters) per minute. This option provides a single 1-5/16" Diameter punching for spout and valve by others. This option provides two 1-5/16" Diameter punching with 4" centers for spout and valve by others. This option provides two 1-5/16" diameter punchings with 8" centers for spout and valve by others. This option provides three 1-5/16" diameter punchings with 8" centers for spout and valve by others. With this option, a stainless steel elbow enclosure is provided to lend a finished appearance to waste piping and protect wheelchair users from burns. Enclosures are mounted to the wall independently of the lavatory to facilitate piping maintenance. Primarily designed for handicapped applications, the specification of this option will provide a chrome-plated, cast bronze strainer and close elbow which allow easy wheelchair access. The elbow permits angular adjustment and features a slip joint connection. Designed for use with Tubular P-Trap (Suffix Option -TPT), this chrome-plated, cast bronze strainer includes a 1-1/4" chrome-plated brass tailpiece. With this option, a stainless steel trap enclosure is provided to lend a finished appearance to waste piping and protect wheelchair users from burns. Enclosures are mounted to the wall independently of the lavatory to facilitate piping maintenance. This option provides a 1-1/4" O.D. x 1-1/2" O.D. chrome plated brass tubular trap with wall flange. It is usually specified along with the -GT Grid Strainer and Tailpiece. 9VDC Programmable Piezo button(s) with 10’ foot connection leads are operated by touching piezo cap to activate solenoid valve. Button(s) have a default 8 second metered flow, but can be programed for additional time on site. Flow cycle can be stopped by touching the Piezo cap before the flow cycle ends. Button(s) are powered by 9VDC transformer or optional 6 AA battery pack (Batteries Not Included). 9VDC Programmable Piezo button(s) with 10’ foot connection leads are operated by touching piezo cap to activate solenoid valve. Button(s) have a default 8 second metered flow, but can be programed for additional time on site. Flow cycle can be stopped by touching the Piezo cap before the flow cycle ends. Button(s) are powered by 9VDC transformer or optional 6 AA battery pack (Batteries Not Included). Buttons marked with H (for Hot) and C (for Cold) are supplied. Option -BRS Brass Valve Body & checkstop assembly are pneumatically operated, pushbutton valves that use atmospheric air. The pushbutton is vandal-resistant and requires less than 5 pounds to activate valve. Valve can be remotely located up to 10 feet from the actuating button and is ideally suited for small chase areas. Air-Control valves are provided with a stainless steel strainer, a brass integral checkstop and conforms with the lead-free requirements of NSF61, Section 9, 1997; Federal Public Law 111-380 and ADA requirements. The -BRS Brass Valve Body option is also available with the 24V solenoid operated valves.